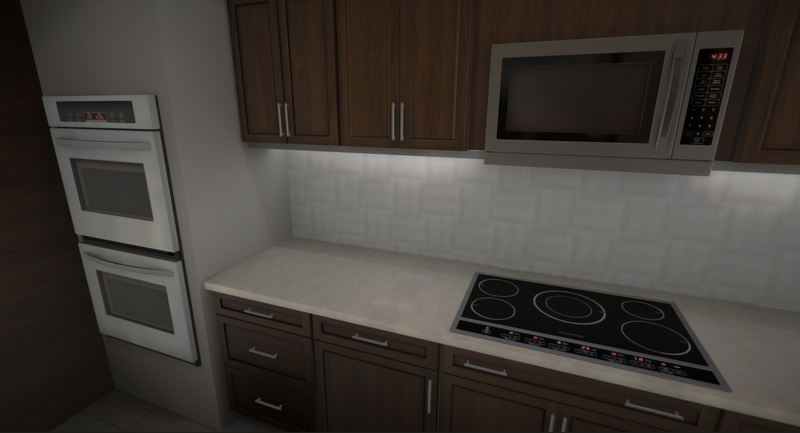 This architectural visualization of a residential condominium real estate development is available to explore in virtual reality with Oculus Rift DK2. 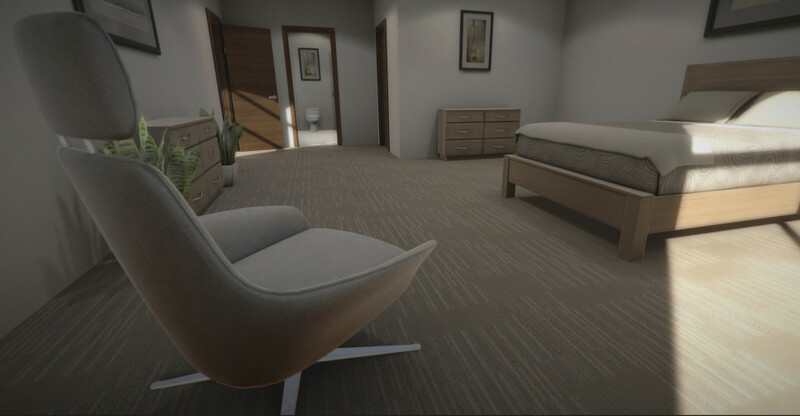 We translated and optimized this Revit / BIM model into Unity 5, then incorporated many features of our new Immerse Interactive platform, which introduces interactivity, navigation, multi-player access and triple-A quality furnishings and fixtures. 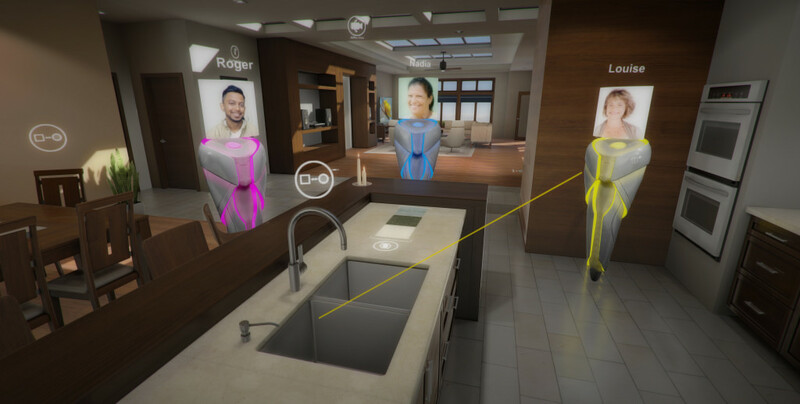 In addition to visual fidelity, this application also emphasizes localization and spatialization of audio to achieve a greater sense of presence and immersion. Well crafted audio is one of the most under utilized aspects of virtual reality development that can make a deceptively huge difference in the perceived quality of the experience. This is an area we will explore in greater detail in future projects. You can configure materials and colors throughout the condo, such as wall colors and floor materials, countertops and more. It also includes the ability to swap alternate furniture items, and panoramic scenery options. We have effectively eliminated motion sickness through a variety of advanced navigation methods. This includes ‘comfort mode,’ with ratcheted strafing and rotation, as well as blink-based teleportation that fades to black briefly while the player is moved to a new location. By removing any sense of vection, players are able to navigate the VR application comfortably. We have also made navigation easy and intuitive for new users, especially those who have never played a video game or used an Xbox controller. By integrating Immerse Collaborative system, we are able to invite multiple people to explore the same environment together simultaneously. They can walk, talk and point at things with a laser, which is perfect for most architecture, construction or real estate visualizations. We have developed rigorous quality standards for the architectural environments and furnishing assets we use in our applications. This application draws upon the Immerse Assets library, which are fully prepared for PBR workflow to achieve the greatest possible realism, and are balanced to incorporate the highest amount of detail possible without compromising our framerate performance targets for virtual reality. Each of these assets is built from scratch, and designed to easily swap materials and colors of each component. 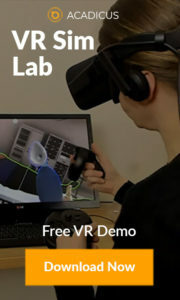 Want to blow your client away with a VR experience? Pre-sell units before breaking ground? Win a new contract by showing off this cutting edge new VR tech? Arch Virtual can help. Send us a note, and we’ll get you a free estimate.